So….. we asked you to watch this space…and here we are… The team at The Temple Skincare & Spa are excited to be bringing you the latest and greatest in treatments from all over the globe that will give you the results you deserve! 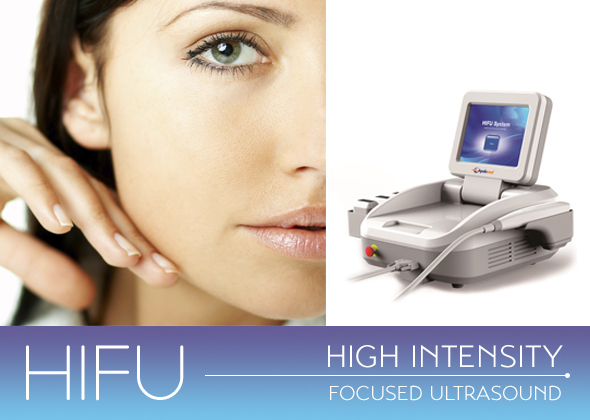 HIFU stands for High Intensity Focused Ultrasound. What is that I hear you think… well its not a laser, its not fraxel, its not Radio Frequency, IPL, skin needling or any other surgical or non surgical skin rejuvenation… its the next generation in advanced facial rejuvenation with deeper penetration, Real visible longer lasting results… AND most importantly, NO damage to the skins surface, NO surgery, NO bleeding and NO scarring! Achieves amazing visible lasting results NATURALLY! 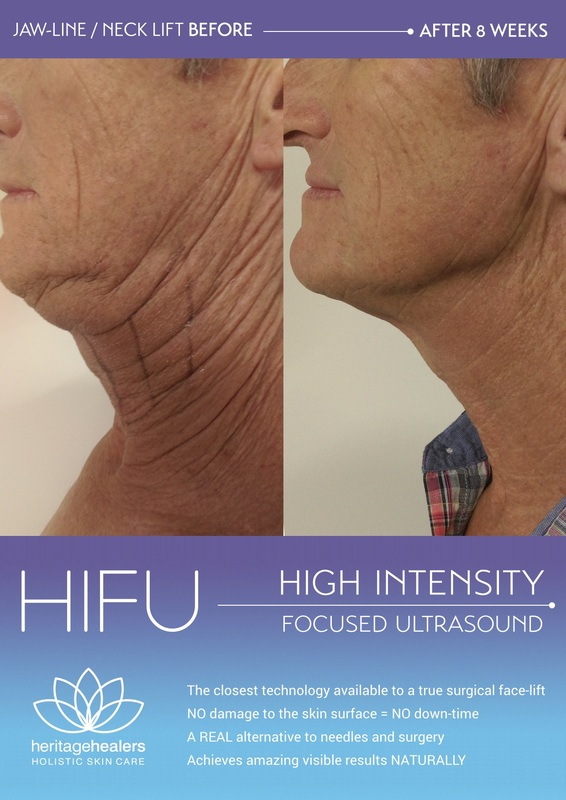 HIFU beams through the surface of the skin to deliver precise and fractional ultrasound energy at exactly the right depths and temperature, to stimulate BOTH muscle firming / lifting AND new collagen production; all with NO damage or disruption to the skin surface! 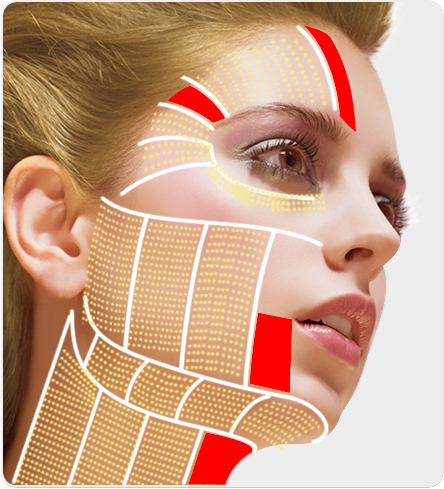 Our clients can go out to lunch after a full facial procedure ! The fundamental principle is similar to using a magnifying glass to focus sunlight, generating a burning heat. Focused ultrasound uses an acoustic lens to concentrate multiple intersecting beams of ultrasound energy precisely on a target point deep in the skin. Each individual beam passes through tissue with no effect (just like normal Ultrasound scan); but at the focal point, where the beams converge, the combined energy has a precise localised thermal (heating) effect. The HIFU delivers High Intensity Focused Ultrasound energy to the deep dermis, subcutaneous tissue, and facial muscle (SMAS) layers. 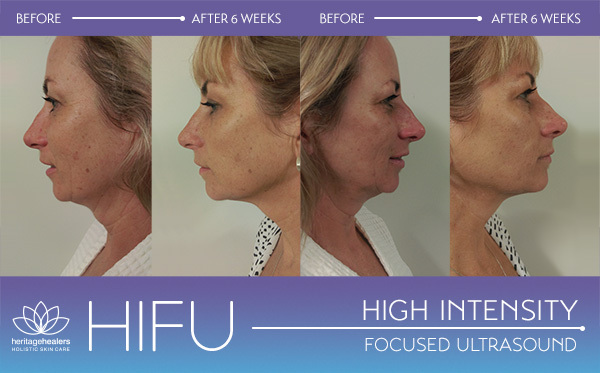 In the deeper levels of the dermis the HIFU targets the connective tissue stimulating collagen synthesis (wound healing response), improving skin texture and lifting. The SMAS (Superficial Muscular Aponeurotic System) layer is responsible for muscular activity in the face (facial expression). By stimulating the SMAS layer, there is a muscle contraction and new collagen synthesis, which over the next 6-12 weeks naturally lifts and firms the skin. The lifting effects continue for up to 6 months as the collagen matrix rebuilds. 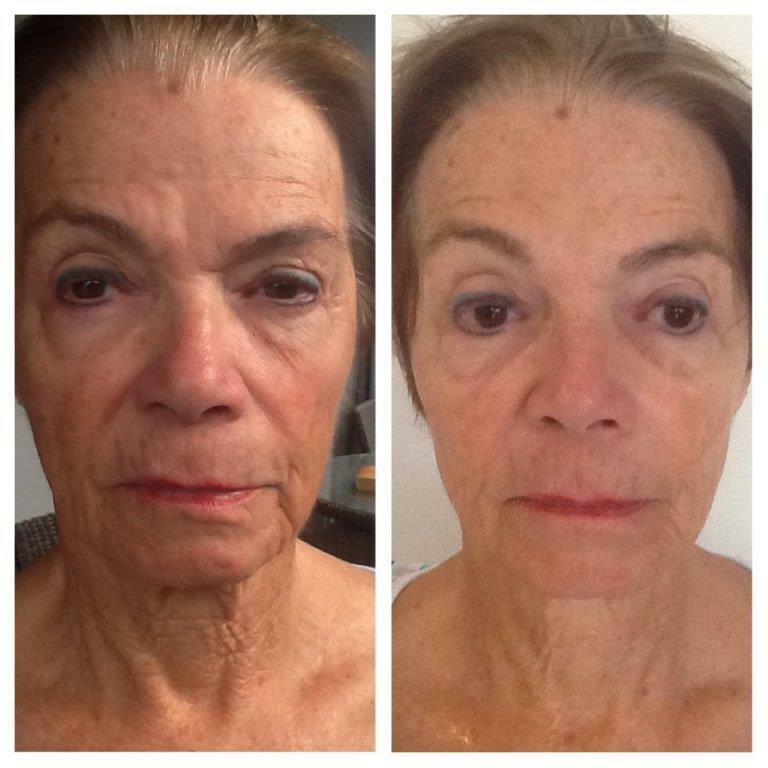 A natural facelift with No painful surgery and NO downtime! SO HOW MUCH WILL MY FACELIFT COST ME? Not anything cost to a surgical facelift, nor the downtime! facial rejuvenation for anti ageing at the same time! This one machine will treat different face and body imperfections simultaneously! yes you heard me right… you relax reading a book or working on your laptop while we freeze your fat! How does Coaxmed for the body work? DUOSHAPE – Radiofrequency + Low Frequency Ultrasound (cavitation) – mechanical vibration and disruption of fibrosis and fat cells; waste fat is expelled from the cells and then eliminated through the metabolism, thanks to the reactivated blood microcirculation. VACULASE – Utilizes laser diodes to reactivate and boosts the arterial, venous and lymphatic micro-circulation, encouraging neoangiogenesis of the intradermal vessels. The laser light energy also has beneficial effects on fibroblast activity. The combined localised handpiece’s tip cooling boosts the volume-reducing effect, optimising reabsorption of the edema by stimulating vascular workout. At the same time, the rhythmic aspiration massage activates the lympho-drainage and tissue stimulation processes, enhancing restoration of the skin’s optimal collagen elastic tension. COOLSHAPE – Fat Freezing – Reduction of fat deposit thanks to the intense cold (-10º) that is able to target only the fat cells in that area. Since fat cells is more sensitive to cold temperatures than other skin cells, it freezes the lipids in the cells which then slowly dissolve without causing trauma or injury to the surrounding tissues. Results achieved with Coaxmed are permanent. Nevertheless, the beneficial effects given by the treatment will be influenced by your life style. Remember: smoke, alcohol, stress and poor eating habits all interfere with the way your body looks. Results are visible even after the first session. Coaxmed combines multiple technologies in the same procedure capable of producing evident changes on skin elasticity, cellulite and inches loss. Depending from the procedure performed, Coaxmed guarantees stable results in only an average of 6-10 sessions. Fat freezing however, visibly reduces the fat by average of 40% in only 2 treatments! Is it safe? And how long will it take to recover from the treatment? Coaxmed is a generally safe, non-surgical, non-invasive procedure that does not require anesthesia. Some people experience mild redness immediately following the procedure, but this usually disappears quickly. Most people find that they can return to work and normal activities immediately after treatment. You may be advised to use soothing skin formulations to apply to the treatment area to minimize any discomfort caused by the procedure. Who is the best candidate for Coaxmed procedure? Adults in good shape with areas of unwanted fat that do not want to undergo surgery are ideal candidates for Coaxmed. Good candidates are already physically active and adhere to a healthy diet. Why choose Coaxmed over other procedures? Clinical trials have shown that the results obtained with Coaxmed are extremely satisfactory and proof the procedure to be effective, safe and without doubt a revolutionary approach in the treatment of cellulite, excess fat and poor circulation. SO HOW MUCH WILL MY NEW BODY COST ME? ***We will be have a pre-launch sale starting next week with serious freebies included in your packages. Be fast to register your interest as we only have 15 FaceLifting Pre-sale packages available… and we only have 20 BodySculpting Pre-sale packages available!! ***Pre-sale ends 31st July 2017 or when all are sold and treatment openings start 1st August. Simply call 96342411 to add your name to the list.